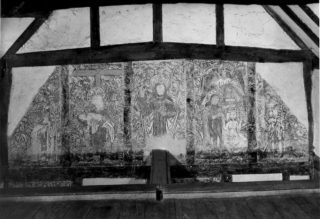 An accidental discovery in 1953 inside one of a row of four cottages at Piccotts End led to the revelation of five panels of historically important medieval wall paintings. Arthur Lindley, the owner of the site and the adjacent garage, found the paintings behind the wallpaper and he spent the rest of his life researching their origin. 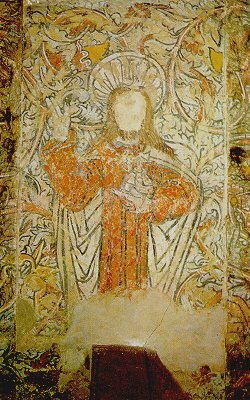 The religious paintings are believed to contain many ‘hidden symbols’. The upper panels show impressive scenes of Christ in Majesty as well as his baptism. Pieta the Virgin, St Peter and St Clement are also depicted, whilst the lower panels depict St Catherine of Alexandria and St Margaret of Antioch. E. Clive Rouse, an expert from the British Museum, concluded that the vivid murals showed a Low Countries influence and wood-cut techniques dating from the late 15th and early 16th centuries. They were probably painted late in the Pre-Reformation period and could therefore only have been on view for not more than 50 years before they were defaced and eventually covered over – an expression of faith that was kept a secret until the 20th century. The nearby Monastery or College of the Bonhommes at Ashridge may be the clue to their existence, since the cottages are believed to have been used as a pilgrims’ hospice. Ashridge was on the ‘pilgrim trail’ because it housed a supposed holy relic – a phial of the blood of Jesus – and such hospices were part of the medieval scene. The Abbey of St Albans, the shrine of the first English Christian martyr, attracted many pilgrims and it is possible that they combined a visit there with one to Ashridge, staying overnight at Piccotts End. The hospice theme continued to be associated with the site when, in 1826, Sir Astley Paston Cooper of Gadebridge House, surgeon to George IV, established the first cottage hospital in the building. It was opened to the public in January 1827 and operations (without anesthetic) were carried out here during the next six years. In 1829, 35 in-patients and 426 out-patients received treatment; it served a wide area locally, from Bushey to Tring, Harpenden and St Albans. Arthur Lindley made a collection of medical implements and Paston Cooper memorabilia in a small museum within the cottages, including his famous ‘spinal chair’. 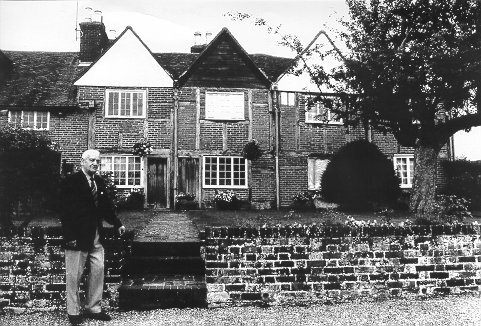 The cottages containing the important wall paintings and the adjoining Georgian house were acquired by a local builder and developer and the collection of memorabilia was sold. The cottages are currently on the market for sale again. Local residents are keen to see the paintings safeguarded for future generations to enjoy and have started a fund to help with this project. Dacorum Heritage Trust, together with Dacorum Borough Council, tried to obtain a Heritage Lottery Grant to purchase the buildings containing the paintings in 2001, but were forestalled when they were sold privately. It is crucial that this remarkable glimpse into the past is preserved and opened for public viewing, as a unique part of Dacorum’s rich heritage. An ‘Options Appraisal’ is being considered to explore the best way forward, but funding is urgently needed to implement this. The cottages containing the murals are Grade 1 listed and must be preserved. If you have any ideas, or can offer support, please contact Dacorum Heritage Trust at 01442 879525.….